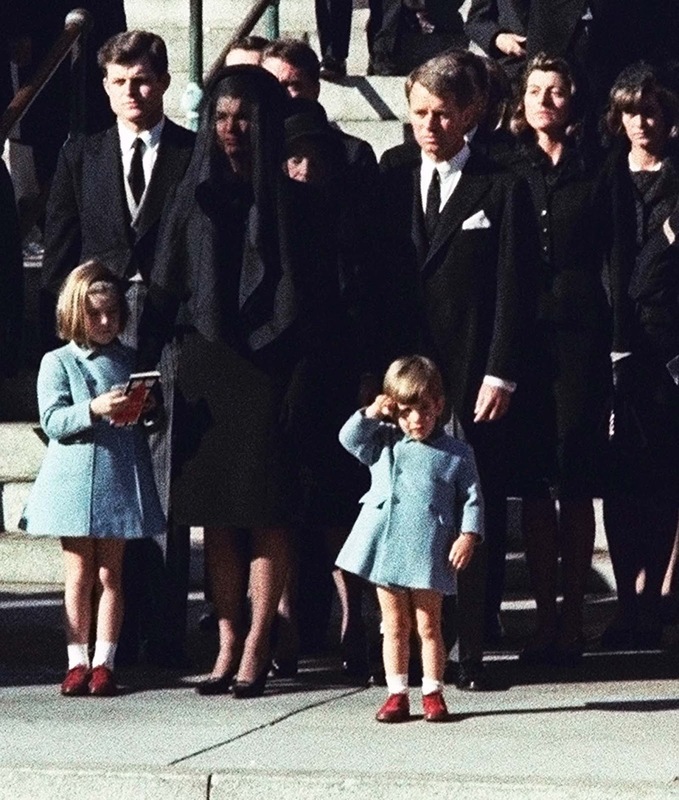 John F. Kennedy Jr., who turns three today, salutes as the casket of his father, the late President John F. Kennedy. 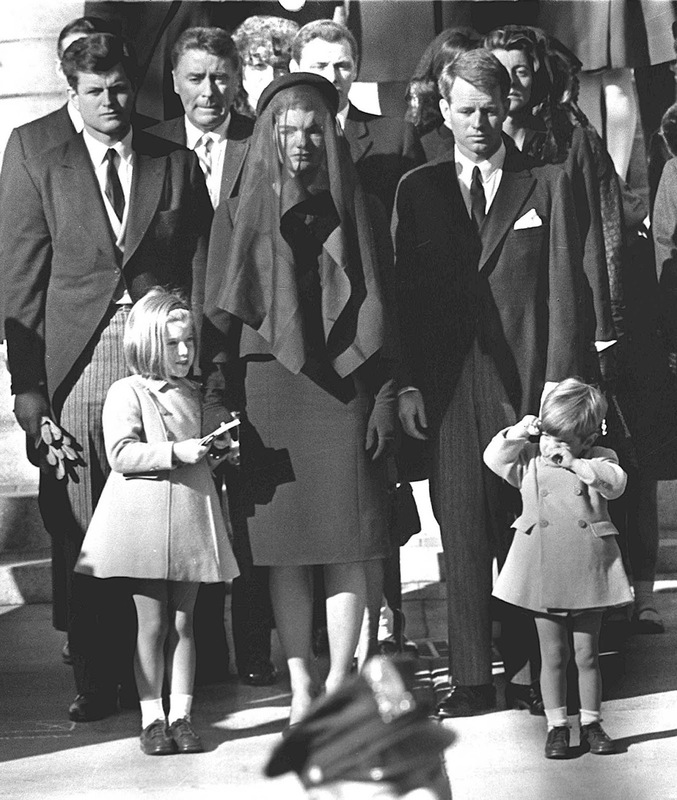 Widow Jacqueline Kennedy, center, and daughter Caroline Kennedy are accompanied by the late president’s brothers Sen. Edward Kennedy, left, and Attorney General Robert Kennedy. In the wake of JFK’s assassination, people around the world mourned and tried to come to terms with John F. Kennedy’s death. Many found solace in the stoic Kennedy clan. Lead by the dignified and unbreakable Jackie Kennedy following the family adage of “Kennedy’s don’t cry”, people ached for her as she and the Kennedy family refused to break down. The youngest member of the Kennedy family three-year old, John F Kennedy Jr. or John-John was no exception. As the casket left St. Matthew’s Cathedral on its way to the President’s final resting place JFK Jr. stepped forward and raised his small hand in salute, an image that broke the hearts of millions. Photographer Dan Farrell, who took the photo, called it “the saddest thing I’ve ever seen in my whole life”. John F. Kennedy Jr. was the first child ever born to a President-elect of the United States. Kennedy died in the crash of a small plane he was piloting, along with his wife Carolyn Bessette-Kennedy and her elder sister Lauren, who was on her way to Martha’s Vineyard. They had planned to drop Lauren off and continue to a family wedding. Photographer Dan Farrell, who took the photo, called it “the saddest thing I’ve ever seen in my whole life”. Why is John-John dressed like his sister? Kids used to be dressed the same until they reached the age of 8. The tradition, called breeching, was the occasion when a small boy was first dressed in breeches or trousers. From the mid-16th century until the late 19th or early 20th century, young boys in the Western world were unbreeched and wore gowns or dresses until an age that varied between two and eight. The main reason for keeping boys in dresses was toilet training, or the lack thereof. The change was probably made once boys had reached the age when they could easily undo the rather complicated fastenings of many early modern breeches and trousers. Breeching was an important rite of passage in the life of a boy, looked forward to with much excitement, and often celebrated with a small party. (Photo credit: Dan Farrell / AP Photo).